Since 1929, JBC has been at the forefront in developing soldering and rework tools for electronics professionals. JBC is now a worldwide renowned brand offering a wide range of products specially designed to meet every operator needs and applications. JBC has headquarters in Barcelona, Spain, and branches in St. Louis, MO USA, in Guadalajara, Mexico, Hong Kong and Shanghai, China, guaranteeing a quick and efficient service with a distributor network covering the 5 continents. In hand soldering, making new products is a real challenge. What we do at JBC is apply continuous improvement to our tools. We use new materials and create new solutions to keep products constantly changing to offer the best possible performance. Constant innovation allows us to offer different tools that meet customers’ precise specifications. As a result of the great praise given to our Excellence range by customers, we have moved a step forward in the Industry 4.0 and have launched the JBC Net, designed to remotely configure and manage JBC stations. 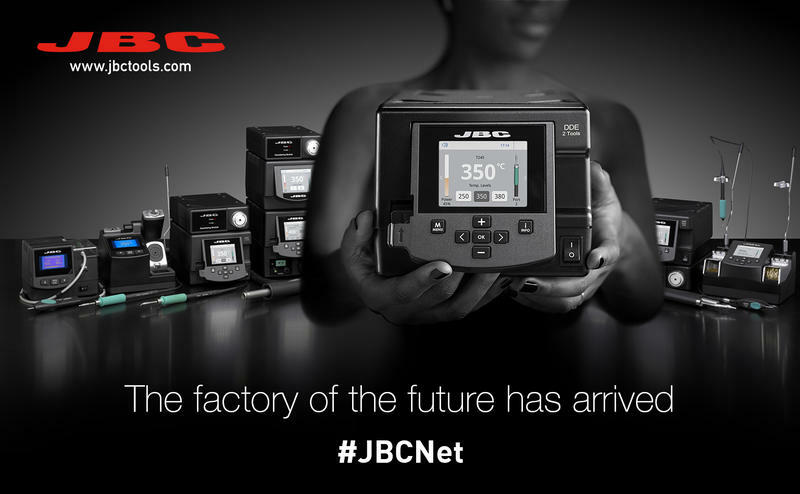 JBC Net is the first smart system to optimize control and traceability in soldering. It allows medium and big companies total control over the soldering process via Internet. They can configure all stations at the same time and apply a specific configuration to each product line, no matter where the factory is located. This innovative system allows you to get complete traceability of materials, processes and performance of your team, optimizing your productivity and the quality of your products.